Music is one of the important fundaments of European cultural and art heritage, thus we believe it is necessary to take care of its development and progress. 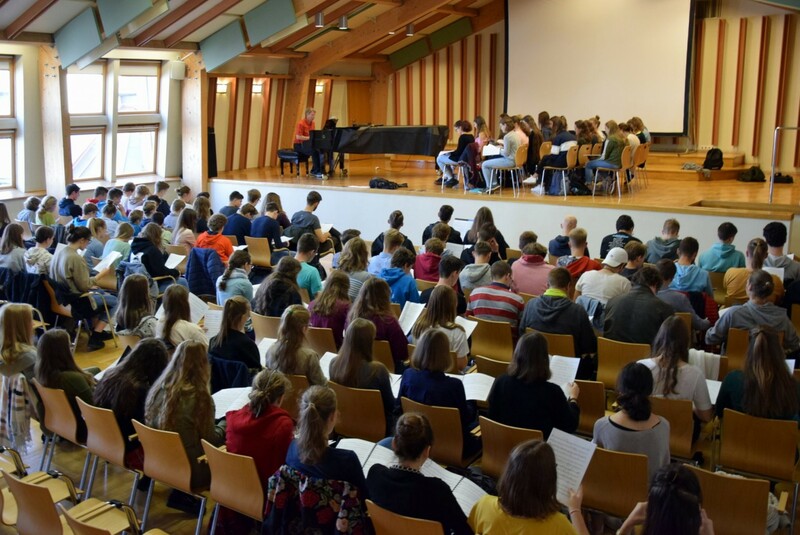 Music to Life is a common project meant to upgrade individual music making of the orchestra and choirs of the Diocesan Classical Gymnasium and Musical Gymnasium of Frederick Chopin from Krakow. The purpose of the project is also to get to know how individual countries work in the field of music; to prepare quality concerts, thus increasing students’ motivation to join the orchestra; to create music for the use of orchestras or choirs as well as design workshops for preschool children, which would encourage music making, enjoying music and promoting any positive impact music makes. On October 5th, the String Orchestra and St. Stanislav Youth Choir of The Diocesan Classical Gymnasium began their journey to Poland, where we’ll be a part of the Erasmus+ exchange Music to Life and will return the visit to the Polish students who visited St. Stanislav’s Institution in May 2018. Approximately 90 students and teachers got on the bus and set off at around 10 in the evening. On Saturday morning we arrived to our first destination, Zakopane, a smaller city and famous winter resort. Excitement visibly filled us with energy and hid our lack of sleep caused by the night drive. After settling in our hotel we had some free time which most of us used to take a walk around the lovely town or hike up a small hill right above our hotel in order to enjoy the breath taking view of Zakopane. Saturday afternoon was the time for our first short concert in one of the local churches. The friendly audience gave us a huge round of applause and eagerly asked for another song although we weren’t too satisfied with our performance. We spent the rest of the evening exploring Zakopane by taking a walk through the city center, enjoying local food and live music in small cosy cafes. On Sunday morning both the orchestra and the choir participated at the holy mass. After that, we impatiently waited to see what “lunch with a surprise” on our programs meant. We were more than thrilled to see horse carriages waiting for us! Local coachmen took us to a big meadow where Polish girls dressed in national costumes welcomed us with their traditional music. They set up fires on which we grilled our lunch while singing Slovenian and Polish songs. In the end we all sang to the melodies of Elvis Presley’s Can’t Help Falling in Love as one. This was a wonderful introduction to our least favourite part of the day – practice. We spent the rest of the afternoon working on our pieces and were proud to see some major improvement as hours passed. 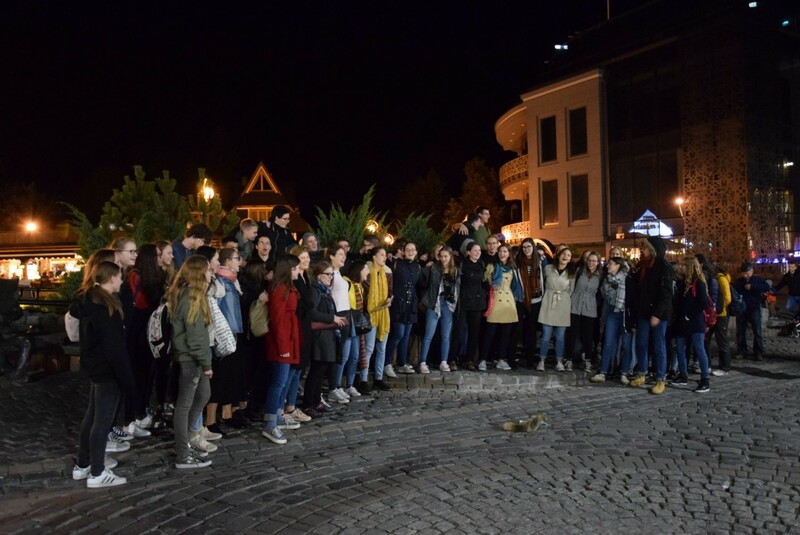 The second reporting from the music tour to Poland runs as follows: on Monday 8th October 2018, we said goodbye to Zakopane and proceeded our journey to Krakow. In the morning we drove to Wieliczka, where we visited the famous salt mines. We could see the underground corridors, learn about the history of mines, touch and taste rock salt and even sing in the fascinating concert hall the chapel of St. Kinga. Its carved walls and floors as well as chandeliers were absolutely impressive. In late afternoon hours we finally made it to our main destination, Krakow. Some students left with their host families, while the rest of us had lunch at the hotel. We spent the evening walking down the picturesque main square of Krakow and singing to people in the streets. The next morning the orchestra and the choir made their way to the Polish conservatory where we had separate rehearsals. Later, the Polish students guided us through the Old Town and surprised us with some interesting legends about Krakow. During our free time we took some pictures, had a cup of coffee or one of the delicious famous doughnuts, maybe took a carriage ride and keenly absorbed Krakow’s lively life. The relaxed afternoon was followed by two intense hours of rehearsal for Rutter’s Mass of the Children, which we will perform on the main concert on Saturday. The start was chaotic as about 150 energetic musicians couldn’t concentrate and just kept chatting. However, by the end of the rehearsal, some parts of the magical melodies sounded quite promising.